NEW YORK, NY--(Marketwire - April 19, 2010) - Cloud Computing Expo at Javits Convention Center -- NaviSite, Inc. (NASDAQ: NAVI) today announced the availability of cloud-based managed infrastructure, applications, and messaging services for enterprise customers in North America. NaviSite's cloud-based services are offered with guaranteed infrastructure and application SLAs, predictable usage-based pricing and are delivered on the enterprise-class, highly available, scalable and secure application-focused NaviCloud platform. With more than 300 business applications experts on staff who understand the complexities of managing and running business applications, NaviSite becomes a trusted partner and transparent extension to enterprise IT organizations, mitigating their risk as they move both their infrastructure and applications to a cloud environment. "What we're seeing in the enterprise space is a desire to have a solution wrapped around their business productivity applications, with the presumption that the underlying infrastructure will be flexible and in sync with those overlay applications," according to Antonio Piraino, Vice President of Tier1 Research. "Being able to control both aspects of IT environment is fast becoming critical to this sector." NaviCloud Managed Infrastructure Services -- NaviSite's world-class hosting and support are designed to deliver secure on-demand infrastructure for complex IT environments with enterprise-class performance for web hosting, server management, storage, database, network and security management, and disaster recovery. Monitoring and management of the platform can be either self-service or performed by NaviSite's 24x7 NOC. NaviCloud Managed Application Services -- NaviSite's in-depth, full lifecycle, expert knowledge of Oracle e-Business, PeopleSoft, Siebel, JD Edwards, Hyperion, and Microsoft Dynamics, mitigates risk and ensures optimal performance as enterprises move their business-critical applications to cloud computing environments. NaviCloud Managed Application Services provide complete end-to-end functional and technical support of applications. NaviCloud Managed Messaging Services -- NaviSite offers hosted Microsoft Exchange and SharePoint, Lotus Domino, and Notes mobile messaging, and email archiving services that integrate messaging environments to deliver anytime, anywhere access to email, contacts, and calendars, and protects from virus and spam. Service Level Guarantees -- NaviSite cloud offerings includes 24x7 monitoring and support, leveraging the NaviCloud architecture, spanning multiple data centers for built-in disaster recovery. All services are also backed by industry-leading service level guarantees for performance, availability, and 'response and resolution' at both the infrastructure and application layer. Predictive Usage-based Pricing -- NaviCloud services are offered with two usage-based pricing options: Pure Usage and Commit and Burst. Pure Usage requires no base level commitment but does not offer a volume discount. Commit and Burst pricing is determined on base-level commitments and can scale up or down based on need. Base-level usage is established by resource utilization during the first 90 days of the engagement to ensure enterprises are only paying for what they need while being able to continually predict their ongoing IT costs. This option automatically includes discounts for higher commit levels and typically yields savings of 20-40%, compared to pure usage-based pricing models. Multi-pronged Auditable Security Model -- As part of the Cloud Security Alliance, NaviSite is constructing a security framework which takes a multi-pronged approach to securing physical, data, identity, compliance, network and infrastructure to address concerns around security threats in the cloud. 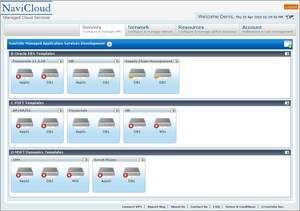 Management Interface for Visibility, Control, and User Administration -- NaviCloud services offer a 'drag and drop' web interface to provision, automate configurations, and monitor and manage IT resources. It provides granular visibility and control of application performance in the cloud environment ensuring that enterprises can readily track resources that are used and be alerted if additional resources are needed. Fully Customized, High Touch Solutions -- NaviSite solutions are not 'one size fit all' and are developed to meet individual customer requirements. They can be easily integrated with a dedicated physical infrastructure or other clouds to create hybrid IT environments allowing organizations to augment their internal capabilities with cloud services. "When we considered moving part of our infrastructure to the cloud, we considered a number of options but NaviSite offered us more than just state-of-the-art, enterprise-class components," according to Rick Blaisdell, CTO at ConnectEDU. "As the nation's leading technology firm dedicated to providing students, educators and employers with comprehensive solutions to successfully navigate education and employment transitions, we required a partner who is technically knowledgeable about our business and has the same philosophy of delivering unparalleled, always-on service to customers. NaviSite's long term vision around cloud managed services, their ability to execute on our unique requirements, and their focus on customer service has made them an important partner to our IT organization and our business." The NaviCloud platform is an on-demand, flexible and customizable infrastructure-as-a-service platform with the scale, performance and security to handle enterprise-wide applications. NaviCloud is based on VMware vSphere™ 4 and is deployed on the Cisco Unified Computing System, with high-performance IBM XiV SAN as well as multi-pronged security approach -- see today's related announcement "Cisco Unified Service Delivery Deployed for Customers at NaviSite's Andover and San Jose Data Centers." The NaviCloud platform spans multiple SAS 70 Type II-certified data centers in the U.S. and the U.K., providing customers with built-in disaster recovery and high availability regardless of geography. "Today marks the first phase of our application-focused, cloud-based enterprise services strategy and is rooted in the belief that enterprise cloud services require a deep knowledge and understanding of the complexities of managing and running enterprise business applications," said Brooks Borcherding, President of NaviSite. "We continue to focus our business on the complex needs of enterprise customers by giving them unparalleled service and support as an extension of their IT team." NaviCloud managed hosting and applications services are available on a limited basis immediately in North America. General Availability in North America is June 1, 2010. Managed messaging services will also be available in June 2010. The London Data Center will be fully cloud-enabled by September 2010.